Number Five brings an adaptable, versatile and mutable energy. Those with Number Five are energetic, productive, and enterprising, with an aggressive side that serves well in business or career. They will experience both change and progress several times in their lives. Number Five creates talents in commercial and media fields, especially careers associated with communication. These people do best when kept busy and can become moody and impatient when work is slow. They must ensure they get enough sleep as their quick mind can become strained without sufficient rest. Daily meditation will be extremely renewing and helpful for them. 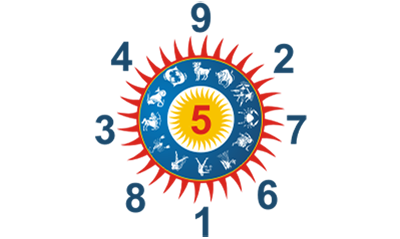 Number Five people cannot afford to indulge in depression and must learn to monitor their moods so that they are graceful with others. Those with Number Five are well liked by others, but must guard against a tendency toward sarcasm and learn to soften their speech with kindness. They embrace freedom and their curiosity. Sculpture, music, mathematics and the arts hold great importance to these people. They benefit from higher education such as colleges and universities throughout their life, as five brings the ability and intelligence to pick up new concepts quickly. They have a natural gift for resourcefulness and can be unshakeable in a crisis. Those with Number Five are here on a path of liberation and freedom. They can help others learn to embrace change.